Humans are naturally sociable creatures. It’s not very often you see people going out to eat or watch movies alone. We go to vacations with friends or partner; we even go out with our pets sometimes. Why do we feel awkward or left out when we are alone? We fear what people might think; the fear of being labelled as weird, anti-social, a snob or an outcast. It is this fear that keeps us from experiencing the perks of being alone. It is in the solitude and the quiet that we really get to know who we really are. There’s no distraction, there’s no one to talk with. You end up asking yourself what you need, and you think about what makes you comfortable. You have only yourself to worry about, and no one to impress to adjust to. You get to reflect about your life; the lessons you learned from your past experiences, you get to assess where you are right at this moment, and you have a clearer mind so you can plan better for your future. When you’re always in a crowd, you always need to take into consideration the people you’re with. You constantly need to think about how they’re feeling, or how your action will affect them. This could be draining. Spending time with yourself can help you get back or recharge the energy you lost being with people. As you become more connected with yourself, you also heighten your senses. You become more aware of your surroundings. You become more sensitive to nature. You become more sensitive to other people when you get to be with a group again. There may be things you want to do that you cannot because your schedule does not synchronize with your friends’. Or maybe they’re not up for it. That’s okay. Who says you can’t do it alone? Go and enjoy what you have always wanted to try by yourself. Go enrol in a lesson or attend a training of the field you’ve always wanted to learn more about. Go travel solo once in a while. Go relish your time alone. There is a certain sense of accomplishment when you get to do things alone. Relish that feeling. Solitude is a great place to prepare yourself for the world. It’s where you become whole, so you can share your whole self to others. It is in solitude where you become more productive as you get to focus on your tasks and accomplish more without distractions. Being alone allows you to feel more independent so you don’t need validation from others. This means you are more emotionally healthy which will make you ready to take on whatever life has to throw at you. Having someone around all the time has its own benefits. That is undeniable. It’s good to have someone to help you carry a heavy object, someone you can talk to when something’s bothering you, or someone you can share your joy and sorrow with. But once in a while, we need to find time alone. We need to disconnect with people, so we can connect with ourselves. So we can recharge, and be the better version of ourselves when we face the world again. Everybody benefits on the perks of being alone. While I am very much a people person, I do need my time alone to reflect, write, heal and become whole. Thank you for this lovely post! It is a pleasure to meet you at #mg M’wah! You said it all Corinne. I crave for this solitude each day and I do manage to pull out some minutes every alternate day. These are me time moments of absolute bliss no matter hoe few they are. Well, being alone is a blessing at times. It’s not all about being sad & sullen. Yes, there is a certain sense of accomplishment when you get to do things alone. You are so right! Since I work from home and my husband is recently retired, it is great when either one of us is gone for a few hours! Agree a lot with you. Once in a while i want to be alone and read books or watch tv and relax. Great post, Corinne. I personally find ‘alone’ times stimulating. We know we are surrounded by family, friends and well-wishers but the time we get to ourselves is probably the best to discover our mojo. I need alone time atleast for 5 minutes every day to recharge.Loved what you said about finding own thoughts through solitude . Corinne, so happy to find your writing home today — and this luxury of being alone is a thing that I’m re-discovering in these days of the empty-ing nest. In the past few years, we’ve gone from being a household of 7 and in just a week we’ll be down to 3! Not sure where the time has gone, but am thankful for God’s leading in all of it. Interesting post, Corinne! Strangely, I have never felt awkward being alone right from young. Been to restaurants, movies, window shopping, even sight seeing on my own. I like my own company just as much as I like others. Hope you had a good Monday! Love and Cheers! I loved reading this Corinne for I am that .1% (Yeah I am the Different one 😉 ) who steps out ALONE to restuarants and movie halls and fairs and flea markets – to enjoy the day in my own company. I take myself for long drives too!!! I learnt it the hard way but self love and self esteem is so so important to own ; more so as a Woman – make that as an Indian Woman!! 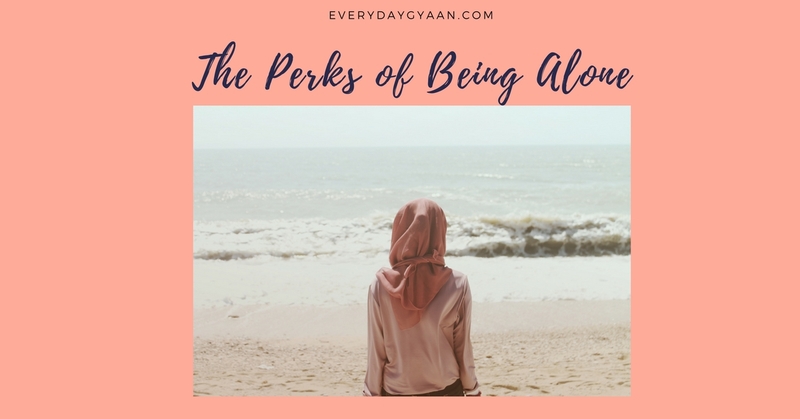 Yes there are tonnes of perks of being Alone and there is a HUGE difference between ALONE & LONELY!!!! \Solitude is a great place to prepare yourself for the world.\ – That’s one insane piece of wisdom! In a household of five, we are rarely all home at the same time, and yet each one of us almost never has alone time. There’s almost always someone else around because of our schedules. As much of an extrovert as I can be, I am at least 25% introvert in that I need my time alone to recharge. I like your point about focusing on self and taking the pressure off by not being around other people. I also like your point about the validation of others. When I’m around people a lot, I often need the time to recharge, to remind myself that I am my own person and that I’m okay the way I am. There’s something about spending time alone for introspection to remember that I don’t need others to approve of my life in order to feel valid or important enough. Great post! I guess I am little weird because I love to go for movies alone and I even eat out alone…I absolutely love my own company and often feel awkward and even claustrophobic when there are too many people around. You’re not weird at all, Balaka. I love my own company too. And eating out alone is a treat I enjoy from time to time. I like being alone too. Sometimes. That second point you made about not having to think about anyone else for a while – that’s a big deal for me. It is exhausting to always have to think of someone else. But I still have to gather the courage to go watch a movie alone. It’s just nicer to laugh or chat while in a theatre. Also eating out alone is such a tough one. But one day, I shall do all of that. Much though I’ve enjoyed the good company of friends and loved ones in the family and outside of it, I’ve also enjoyed the time alone with myself, to see it as an opportunity to recharge and energise myself on a regular basis. I’ve also enjoyed traveling alone and spending time creating some work of art, writing or cooking a meal singing to myself and feeling there could never be anything better than that. I think me-time is a must for everyone to allow time for quiet reflections and personal growth! I love my solitude for all the above reasons. Put me among people for 3 days without any time for myself, I am bound to go insane. While travelling, I often take the night train out. It helps me to do all of the above. A much needed interjection to a otherwise busy schedule. I Love being alone and agree with all the Rs you have shared. Being alone helps me to recharge my batteries, gives me time to reflect on things and of course I relish the me-time. I like being alone. In fact, I really crave for some alone time every day. That is when I can listen to my thoughts, analyse what I’m feeling or simply heal while reading a book. I have never felt awkward being alone and I think it is one of my few strengths.